Each time you create content in a rich text editor like Microsoft Word or Google Docs, hidden HTML code is added to your document to make it look nice on screen. If you then paste that content into a new email campaign, the hidden formatting can change the way your email looks in Mailchimp and email inboxes. In this article, you'll learn about rich text editors and HTML, and how to reduce formatting issues. If you paste from a rich text editor, we recommend using the Paste from Rich Text Editor tool to get your content into Mailchimp. This tool removes code that often interferes with how your text content displays. After the old formatting is removed, you can apply new text styles in each content block. You can find the Paste from Rich Text Editor icon on the Editor toolbar of every Text content block. It looks like a clipboard with a capital W.
To paste content from a rich text editor, follow these steps. Click the Paste from Rich Text Editor icon. 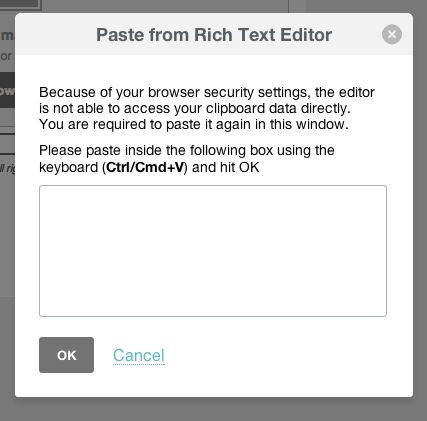 Paste your content into the Paste from Rich Text Editor pop-up modal. We'll keep bold text, links, numbered lists, and bulleted lists, but remove all the other formatting. If you don't need to keep any formatting, try the Paste as Plain Text tool instead, which removes everything except basic text content. After you've pasted in your content, use the tools in the Editor toolbar and content block styles and settings to make any further changes to your content or formatting. Learn why Mailchimp doesn't recommend using Word or Publisher to create campaign content.